Trying to get a little school done before we leave! Life has moved fast and furious over these past several months as we’ve prepared for our mission trip to Russia, but we are as excited as ever! One thing that has helped has been the unbelievable outpouring of financial giving to this endeavor. Over $25,000 has been raised since June and we are reeling over the generosity of friends; family; and churches from California, New Mexico, Nebraska, Illinois, Texas, Florida, and of course, Colorado. I believe the Spirit of the Lord is moving on the hearts of His children to obey His Great Commission, and it is quite humbling to represent you all in the name of the Lord. Thank you for your faith in the Lord through us – may our service honor Him, and you, as we invest our lives in these next few months in the great country of Russia! As I said, over $25,000 has been raised since we first sent out a support letter in late June. In that letter we informed you that our plan was to spend 4 months in Russia and the surrounding countries sharing about Christian home education with families that have expressed interest in learning about this. Although the purpose of our mission has not changed, the timeline has. As we laid out our goals and communicated them to our contacts in Russia, it was clear that we could just as easily meet our goals in a two-month timeframe. And for various reasons, among them the limited resources for translation, we have decided not to travel to Latvia or Kazakhstan, two other countries we had originally considered visiting. Right now, our schedule has us departing Colorado on October 3rd and arriving on the 4th in St. Petersburg, Russia (with stopovers in New York and Moscow). We’ll settle in with the Purcell family who has lived in Russia since 1989 and has graciously (and boldly!) 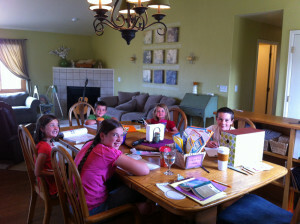 invited our family of eight children and two nannies to live with them in their apartment in the middle of St. Pete! Within a couple of weeks, we’ll all head out again for a small city called Vyborg just 70 miles northwest of St. Pete. There we’ll work with a church whose pastor we ran into at our Colorado homeschool conference and who providentially has been seeking the Lord on how to encourage his flock in learning about home education! After we return, Andie and I, baby Owen Kimery, and at least one of our other children will hop on a plane and fly 7 time zones and 4,000 miles to Vladivostok to stay there for a week, celebrating Reformation Day on October 31st with them, and speaking at a gathering of several churches from around the area – some of these families will travel over 200 miles to meet with us and their fellow sister churches, not an easy task! After spending a week with these precious saints, we’ll head back to our family in St. Pete. Then, finally, sometime in November, we’ll also fly out (some of us) to a city just southeast of the Ural Mountains called Tyumen and spend time with them teaching, encouraging, and equipping them for the task of discipling their children through Christian home education. We’re on the final stretch till departure now, so please pray for peace, efficiency, and LOTS of joy in our final preparations. We have our plane tickets and our visas are in the hands of the Russian Consulate as you read this! Now it’s just a matter of me finishing up some final upholstery projects, preparing our home for Andie’s parents (who will stay here), and finding enough warm clothes for our munchkins! Many of you have asked how we’re doing meeting our financial goal. Originally we had put $28,000 as our goal, and as I’ve said we’ve already passed $25,000. Since we’ve decreased the length of our trip, our living expenses there decreased a bit. Having said that, since we first estimated the overall costs, we have run into more and more resources in the Russian language that we’d like to bring over there to distribute to families to give them a head-start in teaching their children at home. Plus, we have some dear Russian-speaking friends right here in the Denver area who have offered to translate some materials that we have found and developed – there will be some cost for this as well. So, I think what we’d like to announce is that we have all the money we need to live and travel within Russia – Praise the Lord! But if there are any of you who would like to contribute anything to the resources we are purchasing and developing for our Russian brothers and sisters, we would love to raise at least another $2000 for these projects. If you are interested, you can simply write a check to Christ the King Church and send it to the below address; or you can give now, or anytime while we’re overseas, through our PayPal account (which does take 2% off the top). Remember to follow our website while we’re gone. We’re going to start several “Episodes” that chronicle our journey so that you can feel a little closer to what we’re doing over there! We cannot thank you all enough for your love, encouragement, and support for us. Please pray above all that the Lord is glorified every day and through every thought, word, and deed!